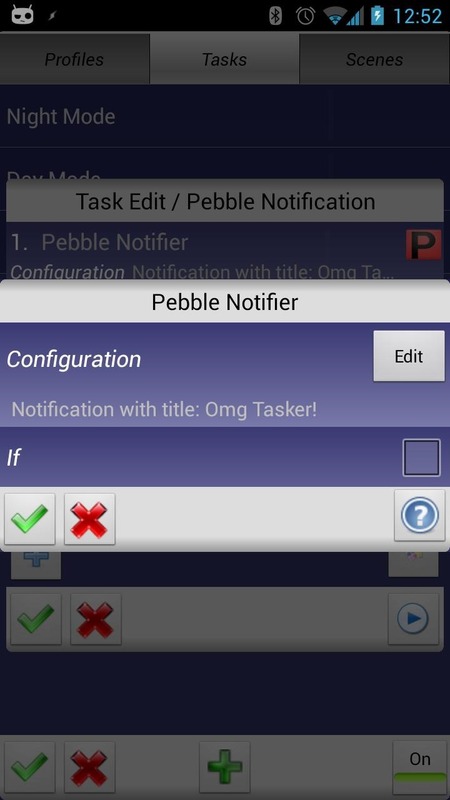 Naturally, the official Pebble app is necessary to make use of the bridge, and the Tasker accessibility service needs to be enabled. (Settings>Accessibility>Set Tasker to "On.") Developer Dattas Moonchaser (yes, really, we couldn't make that up) has kindly released the plugin free of charge, along with the source code and a few basic Tasker profiles. The one posted on the Google Play app description is a quick and easy way to forward all notifications from all apps to your Pebble, turning it into a wrist-mounted external notification bar. Another sends your watch a ping if the phone battery gets below a specified point. You'll need to know your way around Tasker's frustrating interface to start making your own notifications, but we're sure the legions of Tasker addicts can come up with some even more interesting uses. Be sure and let us know your profiles and results in the comments section.